The recession of 2008 has had profound economic consequences for many countries. How and when to reduce budget deficits was a major focus in the recent general election in the United Kingdom and continues to make headlines around the world. The new government has already begun to make large cuts in public expenditure,1 2 even though the UK’s projected underlying debt, as a share of gross domestic product (GDP), is less than that of other industrialised countries, it has longer than many other countries before it is required to refinance loans (table 1⇓), and the actual deficit in 2009-10 was considerably less than expected. Leading economists have widely divergent views about whether the cuts will aid or hinder economic recovery,3 4 but have paid scant attention to the potential effects of reductions in health and social expenditure on population health.5 We examine historical data for insights into how lower levels of public spending might affect health. What little discussion there has been about health in the current economic recession has focused on whether to ringfence NHS spending.6 This is a narrow perspective given the extensive evidence that population health is not only determined by healthcare expenditure but by many factors outside the health system. The evidence, most recently reviewed in detail by Michael Marmot in his report to the British government on health inequalities,7 has highlighted how investments in a variety of social policies benefit health. Thus, children who receive better education, have safe environments in which to play, and who live in good quality housing are more likely to grow up healthy than those who do not. Adults in secure and safe employment, receiving wages above the level needed merely to survive, are less likely to adopt hazardous lifestyles (such as smoking, drinking, or unhealthy diets) and can expect to live longer. The OECD defines social welfare expenditure as “the provision by public (and private) institutions of benefits to, and financial contributions targeted at, households and individuals in order to provide support during circumstances which adversely affect their welfare.”10 This includes spending related to family support programmes (such as preschool education, child care, and maternity or paternity leave), old age pensions and survivors benefits, health care, housing (such as rent subsidies), unemployment benefits, active labour market programmes (to maintain employment or help the unemployed obtain jobs), and support for people with disabilities.7 12 13 All of these could plausibly affect health. Although the OECD has developed standardised definitions and harmonised data collection to ensure comparability across countries, we adjusted the data further to take account of purchasing power parity and inflation. Figure 1⇓ shows a clear association between social welfare spending and mortality in 2000 across EU countries (r=−0.78, P<0.001). However, to quantify this relation, it is necessary to look at results over time and to take account of other factors that might explain this apparent association, such as remaining differences in categorising spending or underlying differences in mortality. We therefore corrected for fixed country differences (by including country dummy variables), reporting estimates of the long term relations between social spending and health within each country. Given that the timing of the effect of differences in social spending is uncertain, the method we used enabled us to account for any potential lagged effects (up to a decade) by estimating mean country specific slopes relating social spending to health.14 Figure 2⇓, in which each point represents each country in each year, shows a clear association between social welfare spending and all cause mortality after adjustment for any country specific factors. If no country deviated from the average social welfare spending, all points would cluster at zero. The models constructed show that each additional $100 increase in social welfare spending has been associated with a 1.19% drop in all cause mortality (table 2⇓). Crucially, our findings were specific to social welfare spending (as defined above); there was no observable protective effect associated with general government spending, which is understandable since military, prison, or similar spending would not be expected to have a visible public health effect. Clearly, it is important to take account of the probability that richer countries will spend more, which could produce an artefactual association between good health (as a result of relative wealth) and overall higher social welfare spending. As in previous research, we found that higher GDP was indeed associated with lower mortality (each $100 increase in GDP was significantly associated with a 0.11% fall in all cause mortality).15 16 However, we also found that a comparable rise in social welfare spending was associated with over a sevenfold greater reduction in mortality of than a similar magnitude rise in GDP (0.80% v 0.11%, table 2[t2]. Furthermore, when we adjusted for social welfare spending, the association of GDP with lower mortality was cut by about two thirds (from 0.28% to 0.11%, table 2⇑). This means that the potential health benefits of increased wealth crucially depend not just on increasing income but on what fraction goes into social welfare spending from governments. We recognise that correlation may not mean causation; we also need to consider multicolinearity (multiple variables that happen to change together) and the potential for undetected confounding that constrains our ability to isolate the effects of social welfare spending on public health. One way to screen for this problem is by comparing mortality from causes where there would not plausibly be a short term relation between health and social spending, such as most cancers, with mortality from diseases where we would expect to see changes with spending, such as alcohol related deaths. Our findings are in line with predictions (table 3⇓) supporting the idea that our findings are not simply due to multicolinearity. In the current debate on spending cuts in the UK, in which some politicians have promised to protect the NHS at the expense of other services, a key question is whether the association between social welfare spending and mortality is driven by expenditures on health care or by the social spending programmes. Table 3⇑ shows that social spending was significantly associated with mortality from diseases related to social circumstances (such as alcohol related deaths) but healthcare spending was not. 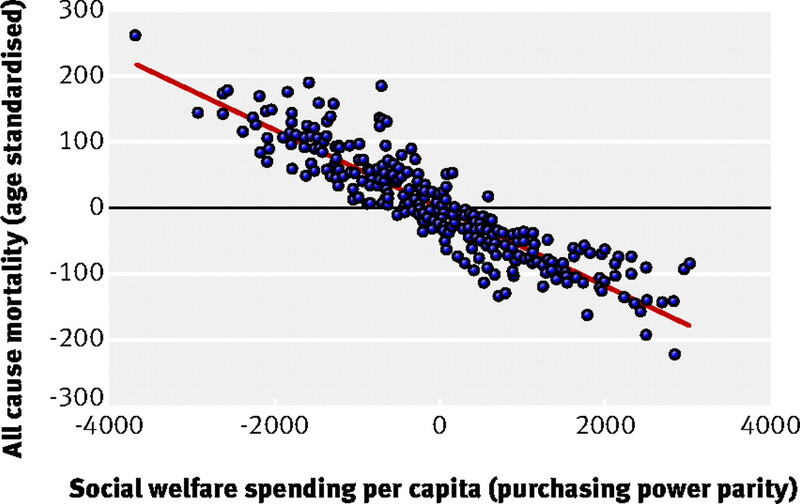 Thus although increases in social welfare spending overall are associated with reduced mortality from these conditions, the effect is due to spending on areas other than health. Future research should look at the effect of different types of social spending (employment versus housing for example). 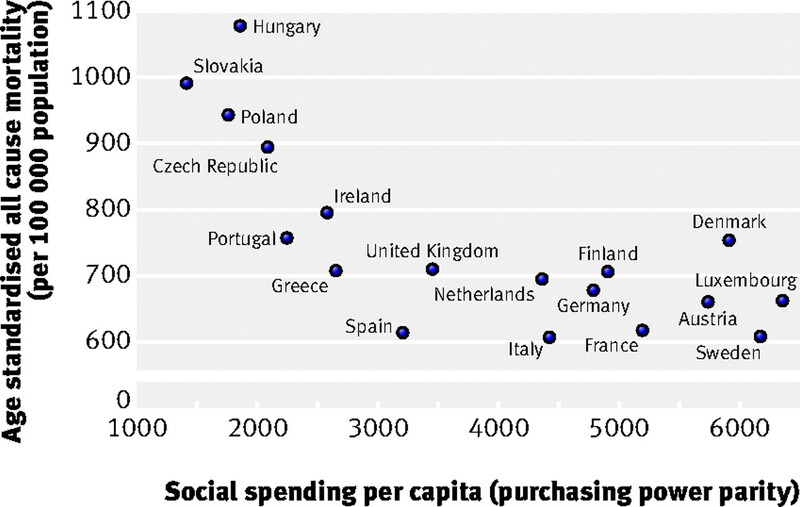 For now, this result indicates that some aspects of population health are more sensitive, in the short term, to spending on social support than on health care, although a caveat is necessary as these countries have not experienced changes in healthcare funding of the scale that might be expected to affect health. Nevertheless, the maintenance of social welfare programmes seems to be a key determinant of future population health that should be taken into account in ongoing economic debates. Sir Michael Marmot’s recent review on health inequalities in the United Kingdom concluded that “Austerity need not lead to retrenchment in the welfare state. Indeed, the opposite may be necessary.”7 The current economic difficulties could be viewed as an opportunity to reorganise provision of services to those in need, creating a broader set of services that reflect the increasingly complex needs of a society facing health challenges as varied as fast food and dementia. It would be unfortunate if this opportunity were wasted. If the first priority of a government is to protect the lives of its people, a statement often made in response to the perceived threat from terrorism,22 then it should take account of the implications of its economic policies for health. Contributors and sources: DS, SB, and MMcK have published extensively on the determinants of health in societies undergoing social and economic transition. The idea came out of discussions among DS, SB, and MMcK. DS did the analyses and drafted the paper, which SB and MMcK revised. International Monetary Fund. Fiscal monitor. IMF, 2010. Stuckler D, Basu, S, McKee, M, Suhrcke, M. Responding to the economic crisis: a primer for public health professionals. J Pub Health (forthcoming). Eaglesham J, Pimlott, D. Economists reject calls for budget cuts. Financial Times2010 February 18. Giles C, Pimlott, D, Eaglesham, J. UK deficit warning from City economists. Financial Times2010 January 3. Stuckler D, Basu, S, McKee, M. How government spending cuts put lives at risk. Nature2010;465:289. Appleby J, Crawford, R, Emmerson, C. How cold will it be? Prospects for NHS funding: 2011-2017. London: King’s Fund, 2009. Marmot M. Fair society, healthy lives. University College London, 2010. Porter A. Business leaders hit back at ‘patronising’ Labour claims on Tory NI plan. Daily Telegraph2010 Apr 1. www.telegraph.co.uk/news/election-2010/7543905/Business-leaders-hit-back-at-patronising-Labour-claims-on-Tory-NI-plan.html. WHO. Financial crisis and global health: report of a high-level consultation. WHO, 2009. OECD. Organisation for Economic Co-operation and Development social expenditure data. OECD, 2008.
WHO. WHO European health for all database. 2008. http://data.euro.who.int/hfadb/. Stuckler D, Basu S, Suhrcke M, Coutts A, McKee M. The public health impact of economic crises and alternative policy responses in Europe. Lancet2009;374:315-23. Marmot M, Friel S, Bell R, Howeling AJ, Taylor S. Closing the gap in a generation: health equity through action on the social determinants of health. Lancet2008;372:1661-9. Jones A. Health econometrics. In: Cuyler A, Newhouse, JP, ed. Handbook of health economics. Elsevier Science, 2000:265-344. Swift R. The relationship between health and GDP in OECD countries in the very long run. Health Econ (forthcoming). Pritchett L, Summers LH. Wealthier is healthier. J Hum Resources1996;31:841-68. Sloper P. Facilitators and barriers for co-ordinated multi-agency services. Child Care, Health Develop2004;30:571-80. Berkeley D, Springett J. From rhetoric to reality: barriers faced by Health for All initiatives. Soc Sci Med2006;63:179-88. Wismar M, McKee M, Busse R, Ernst K. Targets for health: uses and abuses. European Observatory on Health Systems and Policies, 2008. Total Place. Total Place: better for less. 2010. www.localleadership.gov.uk/totalplace. Department of Health. Chief medical officer’s public health awards 2010. www.cmoawards.org.uk. McKee M, Coker R. Trust, terrorism, and public health. J Public Health2009;31:462-5.